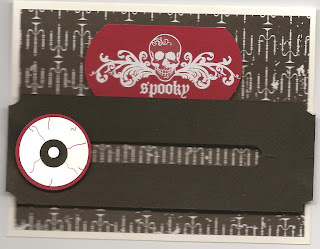 Another fun spinner card from the Wicked Cool set. 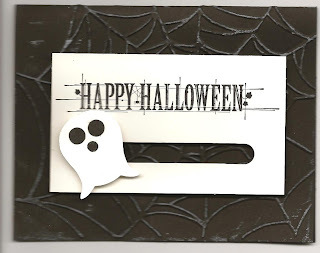 I have been in the craft room working on cards for the next workshop- (Sept. 30th or Oct. 1st- let me know if you want to come), and I got an idea for a spinner card. Then I got another idea...they are so simple and so fun, I think I could make these all day. The rub on is from last years Halloween supplies. The eyeball is punched with the 1 3/8th and 1 1/4 circle punches, then I drew the bloodshot lines. Another stamper had the idea to use a spider web stamp- it looked great. When you tilt the card from side to side the eyeball rolls across the card! Love it! 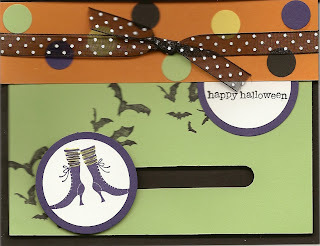 Have you seen the owl punch in the Stampin'Up! 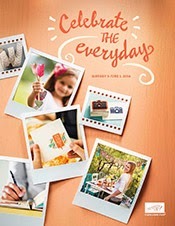 catalog? If you trim off the feet and turn him upside down it is a ghost shape! I added some black holes from my hole punch and made him shimmy across the front when you tilt it side to side. The wed folder from the Holiday Mini catalog www.dawne.stampinup.net/catalogs embossed the black card stock, then I lightly brayerd with the craft white ink. Check back for more great cards- David fixed the scanner and now I can easily get new cards posted! The Stampin 'Up! hostess set, Long Fellows, is one of my favorite new sets. I think the animals are so cute- even my boys love this set and want to see the cards I make with it! This one was made with some old pattern paper I found that had great colors in it. Then I went with Marina Mist and Poppy Parade to pop off the Crumb Cake background. Rounding the corners o everything seemed to fit with the cute whale! 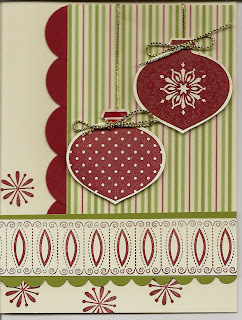 We are making other cards with this set at my workshop this week. Please come! This is one of the cards we made at the last workshop. It is the combination of several great ideas. 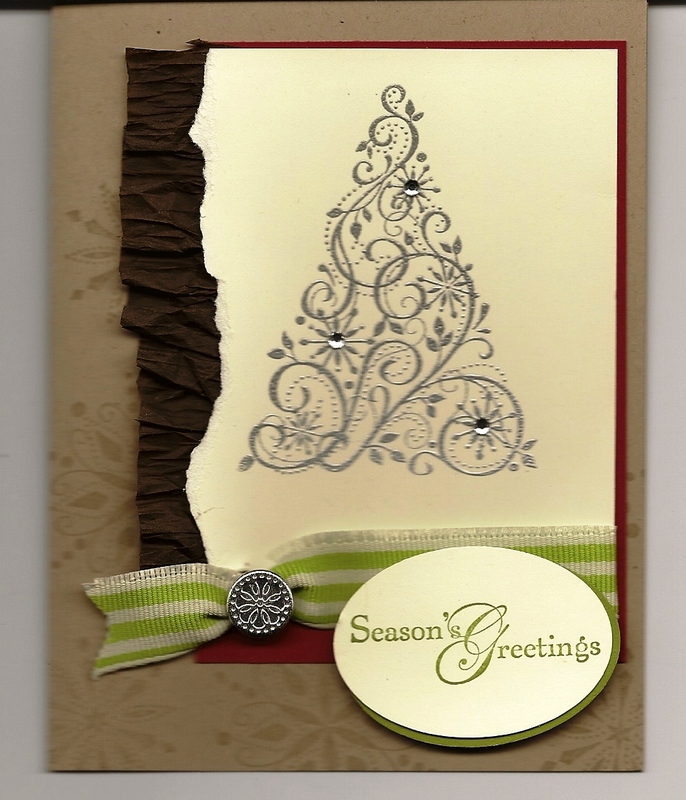 Even though the colors are a little funny, it is Rich Razzelberry card stock embossed with the Elegant Bouquet folder then cut into triangles. The butterflies came from the embossolite folder. 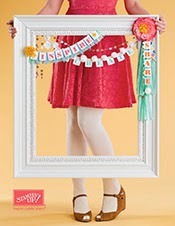 The flower is felt cut on the Big Shot with the Blossom Party die. To tie the ribbon, run the ribbon up from the bottom of the flowers. Tie a loose knot in the ribbon, and run the ribbon back down thru the same hole. The knot is the flower center, and the ends are the 'leaves'. We will stamp again at the end of this month. July 29th and 30th . Please let me know if you want to come. I made this card for fun a while back and thaought I would share it just for something new to look at! Here are the measurements for the side step card we made at the last workshop. Remember these measurements are a little different than others you may see, but my goal was a card that folded flat to go in an envelope. Score the paper at 4 1/8th on the 2 inch side (This is half of the whole piece of card stock. Also the 2 inch width can be changed to any measurement). Score the other side at 1", 1 3/4", 3 1/8", 4 1/2", and 6 3/8".